Though Iraqis voted on April 30, it took the better part of May for election officials to announce the results, which appear to be good news for Iraqi prime minister Nouri al-Maliki. Heading into the elections, Maliki led a coalition of mostly Shiite parties, the State of Law Coalition (إئتلاف دولة القانون), dominated by Maliki’s own Islamic Dawa Party (حزب الدعوة الإسلامية). 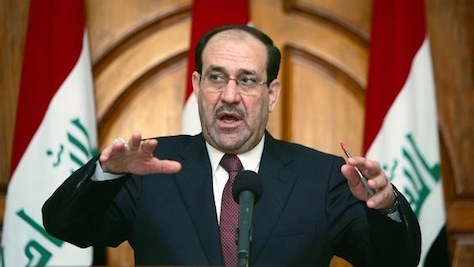 Maliki could rely on 89 seats in the 325-member Council of Representatives (مجلس النواب العراقي‎), Iraq’s unicameral legislature, but he governed as the head of a larger ‘national unity’ coalition after running on a broadly cross-sectarian, nationalist platform in the 2010 elections. Iraqis, tired from the fierce Sunni-Shiite violence between 2006 and 2008, seemed weary of fighting, and the Iraqi political scene was then turning toward nationalism and away from sectarianism. In those elections, Maliki’s State of Law coalition was actually bested by Ayad Allawi, a Shiite former prime minister who led a Sunni-dominated, cross-sectarian coalition, ‘al-Iraqiyya,‘ the Iraqi National Movement (الحركة الوطنية العراقية). Allawi, however, wasn’t as successful as Maliki in building a governing coalition, so Maliki remained prime minister. In the past four years, Iraq has witnessed a return to sectarian violence. After US forces left the country at the end of 2011, terminating a bloody eight-year military occupation, Iraqi security forces struggled to maintain the period of relative calm in which the 2010 elections took place. Instead, by the beginning of 2014, Maliki was regrouping after radical Sunni militias had taken control of parts of western al-Anbar province, including its largest city, Fallujah. Militias are also taking advantage of the Syrian civil war to stir mischief on both sides of the Syrian-Iraqi border. The rise in Sunni-Shiite tension comes as relations between the northern Kurdish autonomous government and the central Iraqi government are also fraught over the issue of oil revenues. Meanwhile, Iraq’s ‘national unity’ government has performed horribly. With corruption running rampant, and with minister more concerned with turf than performance, the country faces daunting problems — power outages, a weak non-oil economy, massive unemployment among a rapidly growing youth population, tax collection failure, among other problems. 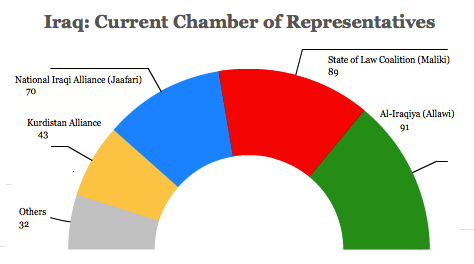 Maliki’s State of Law Coalition actually increased its share of the seats in the Chamber of Representatives from 89 to 92. Under the current constitutional and legal system, elections will not produce any real alternatives to Iraq’s ruling elite. The fortunes of some parties may rise, while others may see their popularity wane somewhat; but the chances of anything emerging outside the current crop of incompetent and corrupt politicians are vanishingly small…. In all likelihood, Iraqis will choose to stay away from the polls in increasing numbers, leaving the politicians to play an aggrandized version of musical chairs while everyone else just watches. If there’s any positive monument to the US-led occupation of Iraq, it’s the relative autonomy and stability of Iraqi Kurdistan, the northern sliver of Iraq. Iraqi Kurds are voting in a parliamentary election today that’s likely to have profound consequences for the future governance of a region that serves as a bulwark against the sectarian conflict in the south of Iraq, a government in Turkey to the north that remains largely unfriendly to the Kurdish minority and a civil war to the west in Syria. The election is notable because the Kurdish president of Iraq Jalal Talabani, who is more responsible for today’s autonomous Iraqi Kurdistan than any other Kurdish politician, lies ill in Germany after suffering a stroke last December. Talabani’s absence makes it likely that the pro-independence party he founded in 1975, the Patriotic Union of Kurdistan (PUK, یەکێتیی نیشتمانیی کوردستان) will suffer losses in today’s election. 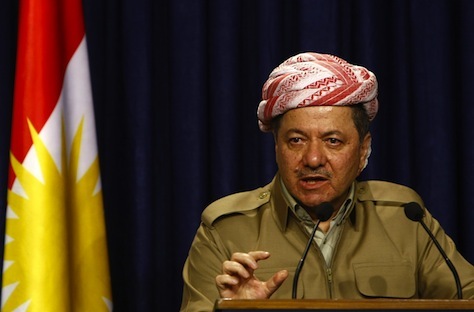 It’s also notable because, for the first time since Iraqi Kurdistan gained autonomy, the PUK and the Kurdistan Democratic Party (KDP, پارتی دیموکراتی کوردستان), will run on separate tickets after an often uneasy alliance first struck in 1992 — the two parties ran on joint tickets in the previous 2005 and 2009 elections, with a joint KDP/PUK administration. 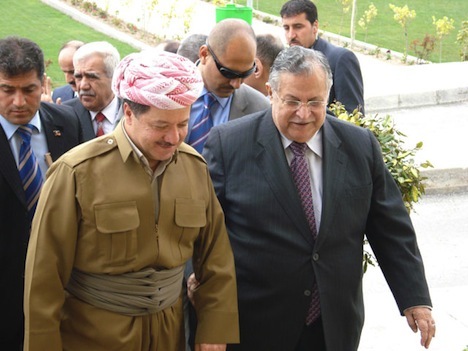 KDP leader Masoud Barzani (pictured above, left, with Talabani, right) has served as president of the Iraqi Kurdistan region since 2005. Home to between 5.5 million and 6.5 million of Iraq’s 31 million residents, Iraqi Kurdistan first obtained autonomy in the early 1990s after the sustained efforts of Kurdish nationalist figures like Talabani in the 1970s and the 1980s, when Iraqi Kurds found common cause with Iranian Kurds during the horrific Iran-Iraq War of the 1980s. After the imposition of a no-fly zone by US-led forces in the aftermath of the Persian Gulf War, Iraqi Kurdistan started to emerge from the iron-fisted rule of Ba’athist strongman Saddam Hussein. The Kurdish government and the national Iraqi government continue to fight over the sharing of oil revenue and internal territorial disputes, especially from near Kirkuk, where Kurds constitute around 50% of the population, though it lies technically outside of the Iraqi Kurdistan region. Nonetheless, Iraqi Kurdistan’s autonomy was cemented with the US invasion of Iraq in 2003 that toppled Saddam. Even as the rest of Iraq crumbled into civil war between Sunni and Shiite militia, Kurdish Iraq only strengthened and Erbil, the capital of Iraqi Kurdistan, became one of the few peaceful urban centers in Iraq. Talabani, who is a Sunni Muslim, became the president of Iraq in April 2005, as an Iraqi leader with primary associations to his Kurdish identity than to the already toxic sectarian rift between Sunni and Shi’a that would come to dominate the rest of the 2000s.